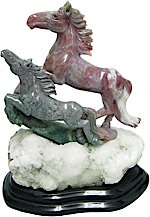 Item #B-13: 2.5"x1.5"x.75" tall Red and grayish Green Bloodstone Dolphin head. Item #B-6: 1.5"x1" tall Red Bloodstone Dolphin head on Red and grayish Green Matrix wave. 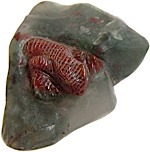 Item #B-7: 2"x2.5"x1" tall dark Red Bloodstone Lizard on greenish Gray with slight Red mottling Matrix. 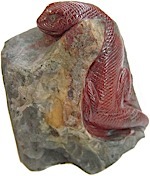 Item #B-17: 1.625"x2.25"x.75" tall dark Red Bloodstone Lizard on greenish Gray with slight Red mottling Matrix. Translucent area on Matrix. Item #B-9: 2.25"x2.625"x2.25"tall Red with slight Gray mottling Bloodstone Lizard on greenish Gray with Red and Yellow mottling Matrix. Item #B-10: 1.75"x2.625"x1.5" tall dark Red Bloodstone Lizards on greenish Gray with slight Red mottling Matrix. 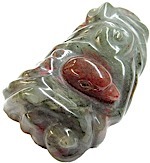 Item #B-14: 3"x1.125"x1.5" tall red Bloodstone seal in grayish green matrix.